Welcome to our tour of England! Unlike most tours, where you are limited to tourist destinations, ours is an opportunity to immerse yourselves in English culture and history and more importantly, get to meet the locals! I am happy to show you all my favorite places, but also guide you to the areas you wish to explore. Afternoon flight from OKC to Atlanta, then overnight flight 'across the pond' to London. We pick up our minibus at the airport and drive to Colchester in Essex, arriving around mid-afternoon. Check into ‘The Red Lion’ hotel, a 14th century coach house in the center of town, and our home for the next two weeks. The staff are wonderful, making everyone feel totally ‘at home’. All rooms (single or double occupancy) have period features including exposed beams and uneven floors, all with excellent facilities including en-suite bathrooms, television, and tea/coffee facilities, and free Wi-Fi. After a couple of hours to unpack and freshen up, we will amble through Colchester for dinner. 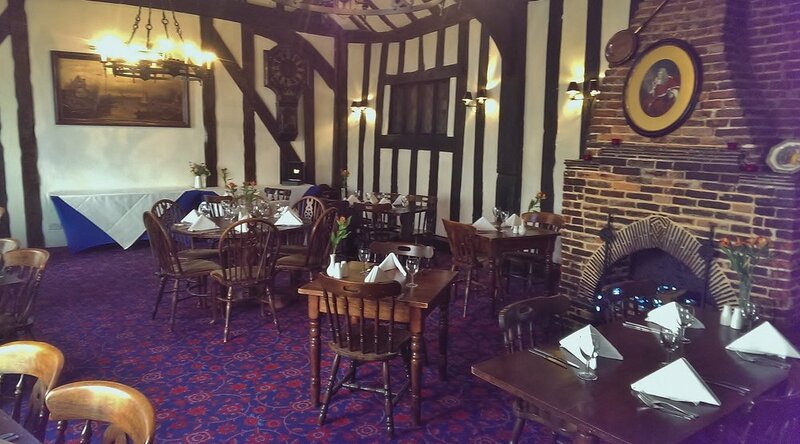 Late breakfast served in the wonderful, old restaurant at The Red Lion is one highlight of each day. A variety of cereals, fruit and yogurts cold meat cuts and cheeses, traditional full English breakfast or kippers with scrambled eggs. Toast, croissant, pain au chocolate, all with coffee, tea, etc; A truly ‘hearty’ breakfast! 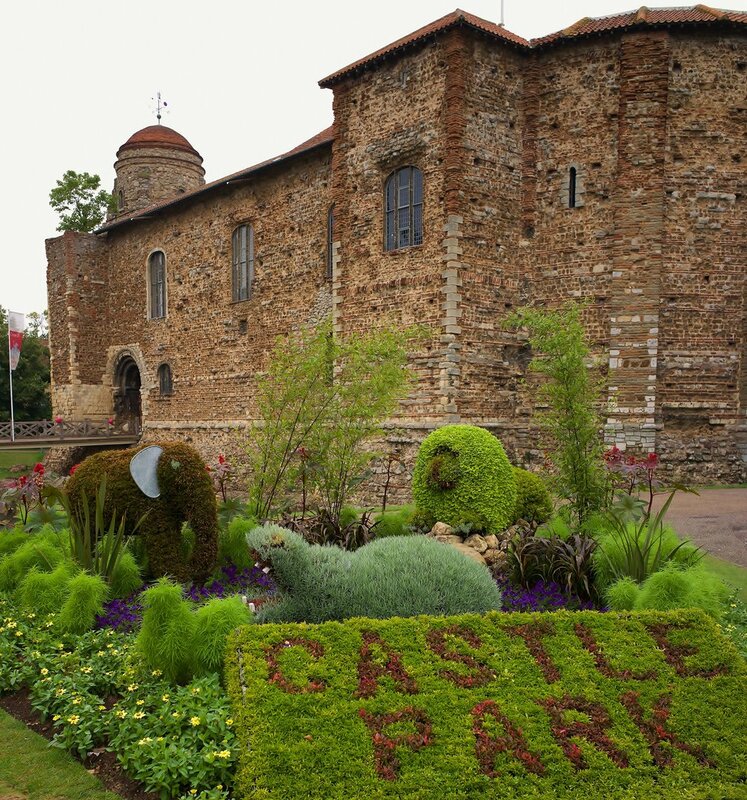 A lazy day to relax after our journey to explore Colchester, England’s oldest recorded town. Our hotel is adjacent to the castle with its extensive grounds dating from the 11th Century, with parts of the original fortified town wall still in existence in many places around the town. The castle is built on the foundations of the earlier Roman Temple of Claudius built around AD 56, these foundations with their massive vaults have since been uncovered and can be viewed today on a castle tour. The castle, ordered by William the Conqueror, was built between 1069 and 1076. In the evening we will visit a wonderful, local golf and country club for dinner and jazz. Travel by train to London: Tickets provide access for a full days travel on all central London tubes and double decker buses. Visit the world famous Portobello Market in the morning; some 3 miles of bustling stalls and market vendors selling antiques of every description, haut couture as well as vintage clothing and food of every ethnicity. Hop on the tube to Knightsbridge and Harrods; where the Queen shops! Harrods pride themselves on being able to source anything your heart desires….and wonderful cream teas! The food market in the basement is sensational. After dinner we attend a candle lit classical music performance at St. Martins in the Field; one of London’s oldest churches dating from the 11th century. World class performances in an stunning authentic acoustic, using period instruments make this an unforgettable evening! Late breakfast, followed by an English ‘boot fair'. Rather than hold ‘garage sales’ as in America, Brits congregate at a local park to exchange or sell their goods from the ‘boot’ of their cars. Just outside Colchester is one of the largest boot fairs in the east of England, and an excellent place to spend a sunny Sunday morning; you’ll be amazed at what you can find! During the afternoon we will make the short drive to Dedham, a beautiful, small Essex village where the romantic painter Constable did most of his work. His father, a wealthy corn merchant, owned Flatford Mill, which became the subject of one of his most famous paintings: 'The Hay Wain'. A wonderful, picturesque walk from Dedham along the river Stour to Flatford to see the mill and other landmarks featured in Constable's paintings, with a visit to the museum to see examples of his work. After working up an appetite with a walk, we will visit an old English tea room for traditional cream teas with real Cornish clotted cream! A proper English cream tea! We will travel north to Cambridge for the day. Home of England’s most famous university, and a wonderful market town steeped in history and lore. Parking to the west of Cambridge allows us a walk through the university grounds, passing famous colleges and crossing the river Cam with numerous punts available for hire and very knowledgeable, amusing students at the helm. Into the city center, stop by the chapel at Kings College and catch the choristers in practice, or visit the daily market and numerous shops catering to the university make this an experience to remember. Dinner is in the courtyard of the Eagle pub, where in 1953 Watson and Crick announced they had “…discovered the secret of life…” the discovery of DNA. Real ale steak pies, banger's & mash, all in a famous courtyard setting. To conclude our day, a wonderful production of a Shakespearean comedy, performed by the students in the beautiful grounds of Kings College, with warm mulled wine served during the interval! A relaxing morning in Colchester, followed by a short drive to Mersea Island. Located on an estuary to the Thames and cutoff daily by the tide, we will visit the ‘Company Shed’ for lunch. Renowned as one of the best fish restaurants anywhere, but basic! The boats pull up at the rear of the ‘shed’ with freshly caught fish which are brought to the table moments later; you will never experience fresher, but bring your own wine, bread or anything else you might need; they only supply the fish! Not to worry; we will stock up in Colchester prior to our visit. Visit Covent Garden Market in London, with its numerous stalls selling unique, handmade jewelry, bath robes and paintings with street performers every few yards. Walk from there through historic streets to Leicester Square; explore Soho, Piccadilly Circus and the famous shops on Regent Street: Hamley’s toy shop, Liberty and the Ferrari store to name a few. Stray behind Regents Street into the pinnacle of fine shopping with the most expensive stores in London. Dinner in Soho, with tables spilling into the streets. A short walk to Regents Park, one of London’s largest royal parks, with stunning rose garden, in the center of which is the open air theater where we will see a world renowned theatrical performance. A short walk after the theater takes us to the top of Primrose Hill, and a spectacular panoramic nighttime view of central London, very popular with locals! A scenic drive, crossing the QEII bridge to Brighton for the day. Spend the morning exploring the famous pier, Royal Palace and old ‘lanes’ with cobbled streets and numerous antique shops and boutiques. Lunch is traditional fish & chips served in newspaper whilst walking on the beach: so British! Travel back along the south coast via the White Cliffs of Dover, then up through the county of Kent, known as 'The Garden of England' with its numerous orchards and hop gardens, with many distinctive oast houses seen nowhere else. Drive to Royal Tunbridge Wells in Kent. Stroll through the cobbled streets of the Pantiles and visit the spa, lunch among the markets and bustling but laid back atmosphere. Later in the afternoon we will drive to Hever Castle, home of King Henry 8th and his wives Anne Boleyn and Anne of Cleves. Tour the castle and its spectacular grounds, in the evening we will attend the picturesque open air theater within the castle grounds. My boyfriend I went on the 2015 July trip. Lazy breakfast before driving the few miles to Coggeshall, famous for its tiny antique stores and pastel colored houses, then just down the road to my home in Feering; a typical, unspoilt English village with its 850 year old church and pub on the small green. Walk along the river building an appetite thenstopping at a 16th century inn for traditional British Sunday lunch; roast beef with yorkshire pudding! A quite day in Colchester for all that last minute shopping and finding gifts to take home for family and friends. In the evening our last farewell dinner and a chance to reminisce over all the amazing sights and new experiences from the past fortnight! Early morning drive to the airport for our flight home.